“IT MATTERS not whether individuals reason well or ill…Truth arises from the collision,” said Charles-Louis de Secondat, Baron de La Brède et de Montesquieu. Judging from the flame wars on Twitter, the nastiness of Facebook comments and the vitriol on Reddit, there are certainly a lot of collisions in the digital public sphere. It is less clear that they produce much truth. Montesquieu, a French political philosopher of the early 1700s, is best known for the “separation of powers”: the idea that a government divided into three branches—executive, legislative and judicial—works best, because power is not concentrated. But the context of his times is crucial. In the early Enlightenment, Montesquieu and other thinkers were regularly composing pamphlets and treatises, an explosion of information similar to today’s digital-media deluge. The central debate was over “luxuries”. That is, whether the nascent economic system, capitalism, was a praiseworthy expression of human freedom that produced material plenty, or a wicked system that corrupted values of patriotism and piousness and created inequality. Montesquieu, ever the moderate, espoused a middle view: he embraced the modern but with reasonable constraints. His thinking is relevant today, as society debates the good and ills of social media. Montesquieu believed that “political liberty in a citizen is that tranquillity of spirit which comes from the opinion each one has of his security, and in order for him to have this liberty the government must be such that one citizen cannot fear another citizen” (“Spirit of the Laws”, book 11, chapter 6). For Montesquieu, liberty is an opinion and formed based on facts. For citizens to defend their liberty from abuse, they need to have access to reliable information to identify possible threats. In this light, misinformation online prevents citizens from enjoying their liberties. Authoritarian governments, populists and far-right parties use social media to shape public opinion using false or divisive messages. Instead of tackling social and political problems with thoughtful policies, they point the finger of blame at perceived threats such as refugees, immigrants and minorities. Through misleading information and scapegoating, they undermine democratic debate, civil liberties and human rights. Montesquieu, instead of siding with conservative or libertarian voices in the debates of his day, took a centrist position. “I say it, and it seems to me that I have written this work only to prove it: the spirit of moderation should be that of the legislator; the political good, like the moral good, is always found between two limits” (“Spirit”, book 29, chapter 1). Montesquieu would certainly argue that the digital revolution could enlarge the scope for democratic debate and public deliberation, so long as our democracies bridged the gap between innovation and under-regulation. Judging by his response to the debates over the political economy in his own day, the French philosopher would argue that policymakers should create rules to ensure rights on social media to things like “the protection of personal data”, “freedom of thought, conscience and religion” and “freedom of expression and information”. Consider how his arguments dovetail with the points set out in articles 8, 10 and 11 of the EU Charter of Fundamental Rights (EUCFR). First, data. Montesquieu would surely argue that policymakers must affirm citizens’ “right of access to data which has been collected concerning him or her, and the right to have it rectified” (EUCFR, article 8, paragraph 2). By effectively enforcing this right, “each citizen would have his own will and would value his independence according to his taste”, Montesquieu would say (“Spirit”, book 19, chapter 27). Next, separation of powers. Montesquieu famously argued that “When the legislative and executive powers are united in the same person, or in the same body of magistrates, there can be no liberty” (“Spirit”, book 11, chapter 6). Comparably, Montesquieu would probably opine that there can be no effective check on the abuse of freedom of thought in social media, unless the purveyor of user-generated content is separate from the one who establishes its legitimacy (EUCFR, article 10). To achieve this, he would warmly embrace the idea that content on social media be “subject to control by an independent authority” that ensures its “compliance” with the relevant laws (EUCFR, article 8, paragraph 3). Third, free speech. Montesquieu believed that “in order to enjoy liberty, each must be able to say what he thinks” (“Spirit”, book 19, chapter 27). Accordingly, citizens on social media must be able to form their opinions “without interference by public authority and without frontiers” (EUCFR, article 11). Toward this end, Montesquieu would surely argue that policymakers must do more to protect free expression by combating propaganda and state-sponsored trolling. Failing to do so, citizens “would immediately feel that life and goods are no more theirs than their way of thinking and that he who can rob them of the one can more easily take away the other”, Montesquieu would say (“Spirit”, book 29, chapter 27). Baron de Montesquieu could not have dreamt of the vast array of media we use to freely communicate our opinions in liberal democracies today. 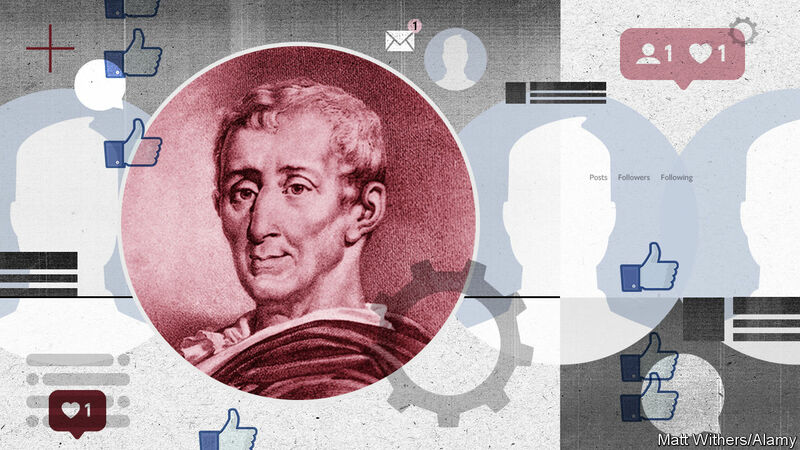 The manipulation of public opinion on social media, and the abuse of privacy by big-data companies, threaten the values that Montesquieu sought to protect. In our time, the price of defending our minds and liberties depends largely on whether policymakers develop rules to protect people on social media. Montesquieu has much to offer. In his view, today’s tech giants must be ready to “sacrifice” their “ease”, and policymakers must let “small interests cede to greater ones” to protect our democracies from abuse—“like hands rescuing the body”, as Montesquieu put it. 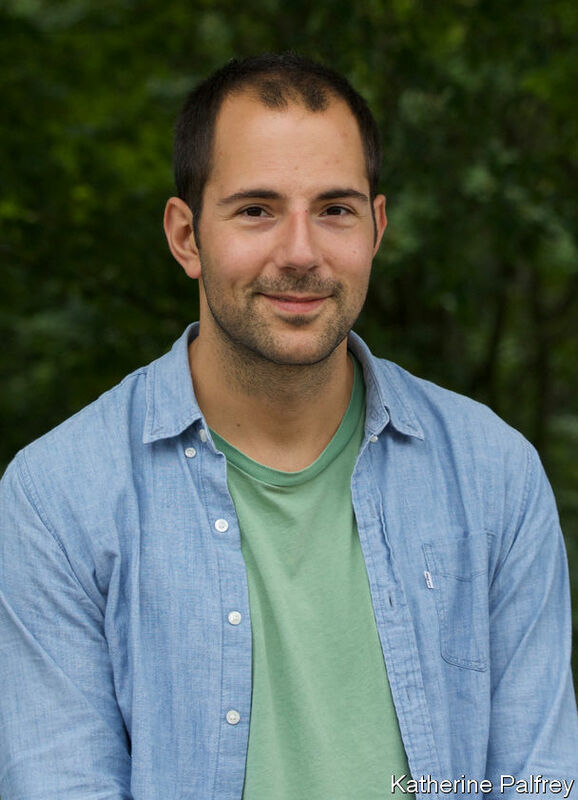 Andreas Aktoudianakis (@andreas_akt) is special assistant to the director at the Open Society European Policy Institute in Brussels, where he specialises in populism, European politics, digital politics and liberalism.